Have you been searching for used car lots near me that offer a great variety of used cars, used SUVs, and used trucks for sale near me? When it’s time to decide on what your next vehicle is going to be, do you know where to go? Acra Automotive Group is the only used car family of dealerships you need in your search for used car lots near me for a full inventory selection. Acra Automotive Group has such an expansive range of used vehicles for sale to choose from in Greensburg, Shelbyville, and Columbus IN. With such a complex variety, the selection they provide should be able to please almost anyone's taste. At Acra Automotive Group, we have a significant amount of brand-named automakers at our used car lots in Columbus IN, Greensburg IN, and Shelbyville IN. We aim to provide the best-used car shopping experience around. With such a large selection of vehicles, it's no wonder people all over Indiana pass up other used car lots near me to come to the Acra Automotive Group dealerships to find the perfect used vehicle that fits their lifestyle and their budget. Are you looking specifically for used cars for sale near me at used car dealerships near me in Columbus IN? Acra wants it to be easy to find the right used car for sale for you, all from the convenience of your home or smartphone. You will see that the Acra Auto Group used car websites can quickly and easily be sorted by the type of vehicle that you are looking for. Once you have found the used cars for sale near me on our easy to use Acra new and used car website that you want to compare, come to take it for a test drive today. You will find that it has never been easier to compare used cars for sale than when you are on the Acra Auto Group used car websites. So, when it comes time to compare trucks, visit our Acra used car website or come to our used car lots near me in Columbus IN, Greensburg IN, and Shelbyville IN. Are you looking for used cars for sale in Columbus, Indiana that offers excellent gas mileage? We have the economic car just for you. Like the Mazda3 Touring used car for sale at Acra Columbus. This used car for sale can average and MPG of 30 miles per gallon in the city and 41 MPG on the highway! This used car for sale at Acra Columbus has many desirable features such as steering wheel cruise and audio controls, push-button start, and a rear backup camera. Steering wheel controls are both a convenience feature and a safety feature alike. It gives you the ease of controls right at your fingertips which in turn keeps your eyes on the road and hands on the wheel. The built-in backup camera on this used car has color-coded grid lines. Now getting into and out of even the smallest of spots will be more accessible than ever when you buy this used car. 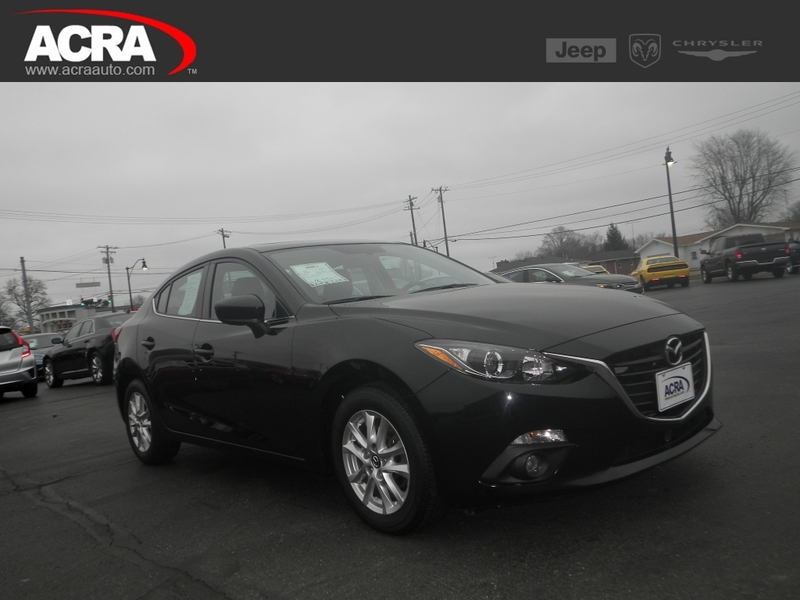 Whether it is this used Mazda3 for sale or another one of our used cars for sale at Acra Columbus, we have the perfect car waiting for you. Drivers all over Columbus IN, Greensburg IN, and Shelbyville IN love our used cars for sale and you can too when you come to one of our used car lots near me. When you are looking for used car lots near me for used cars for sale near me, come to Acra Automotive Group. You can find Acra Pre-Owned Superstore is located at 2820 North National Road in Columbus, IN 47201. Acra Chrysler Dodge Ram located at 1407 North Lincoln Street in Greensburg, IN 47240. Acra Pre-Owned Superstore is located at 1200 East State Road 44 in Shelbyville, IN 46176. Acra BuyRight is located at 920 North Michigan Avenue in Greensburg, IN 47240. Stop by the car lots near me of Acra Auto Group today.